Threading and pattern came from Handwoven Sept/Oct 2018. This is a dornick twill. The original pattern called for 8 colors, but I used 5 - 2 reds and 3 yellow/golds – all 10/2 mercerized cotton purchased from Hillsborough yarn shop. It also called for 2 stripes and I adapted to 1. The plan called for 6 napkins, but I made 12 and warped enough for a runner as well. My son Stewart helped warp the loom! Thee shawls woven on 10/2 mercerized cotton warps dyed by Kathrin Weber of Blazing Shuttles. The first was woven with a 20/2 gold tencel weft. the second with a navy blue 30/2 silk weft, and the third with a caramel colored 30/2 silk weft. He says:"I just finished 2 scarfs made with 8/2 cotton in black and silver. The project was from HandWoven Nov/Dec 2017. I also made a 12-inch sample to keep in my finished project binder along with the instructions." Sue Taube's wool blanket. She says "I washed it in hot water with eucalan washing soap, threw it in the dryer for 15 minutes & hung it to dry. It is 100% “tuna” wool from Vavstuga , broken twill/ goose eye; 40”x46” finished size!" "10/2 cotton warp and 30/2 silk weft. The variegated cotton in the warp was a gift from my friend Sue. Playing around with the turned twill tie-up allowed me to get stripes on just one side of the scarf. This was very exciting for me!" ​Knitted Shawl designed by Kathryn Roberts (a new weaver and guild member, but an accomplished knitter) Spring 2018. Kathryn says: “ I challenged myself to use a lace weight yarn without a lace pattern, breaking the expectations of lace yarn. Patti Kilpatrick wove mug mats in doubleweave overshot. These were all woven in the Sun, Moon, and Stars Pattern with a 5/2 pearl cotton warp. She got a great variety of colors for her mats by choosing different weft colors for the front and back of the mats. 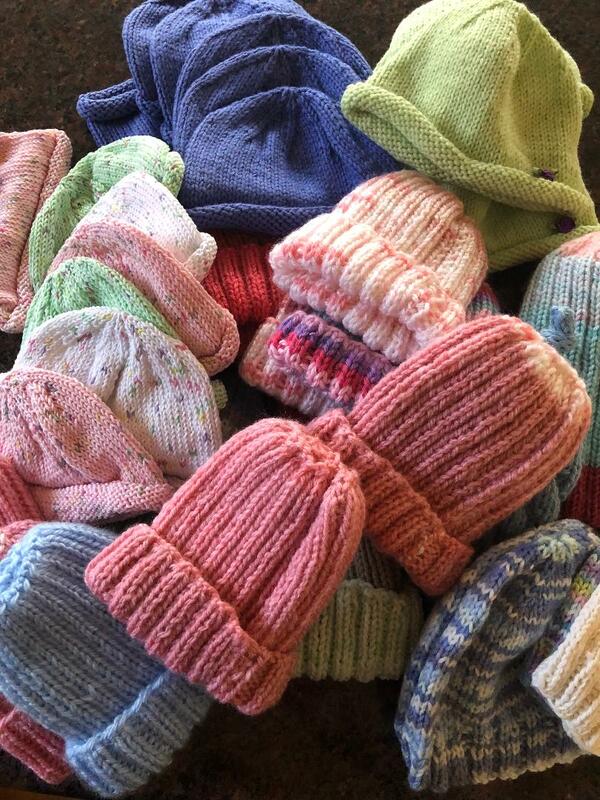 ​Sally Kahler will be weaving baby blankets for each of her four new granchildren this spring. The first one is pictured here on the left. The scarf shown on the right was woven on a painted warp and will be auctioned off at Golf for the Pink in May. Variations on M and O Towels from "Simple Weaves". ​A 4 harness weave, woven on a cottolin warp with linen and cottolin wefts. The runner was woven with red and gold 5/2 and 6/2 cotton, sett at 36epi. She wove it in Doubleweave Overshot, adapted from the Berea Sunflower overshot pattern in Marguerite Davison’s book. Scarf by Donna Eash, a beginning weaver, wove this beautiful, warm and snuggly scarf. She says: "here is the first Cricket Loom finished product. Woven from Scrap Exchange finds." This runner is based on the Belle Creole bed scarf in the Jan/Feb 2015 issue of Handwoven Magazine & inspired by the brightly colored textiles I’ve seen from Mexico, thanks to Mary Anne Kluger. I had the bright idea to go crazy with color, which was completely outside my comfort zone. While it was on the loom, I kept questioning my bright idea. When I finally finished it, I was glad I tried something different & am very pleased with it. 10/2 mercerized cotton (UKI dark Sierra) was used for the ground cloth & I doubled the 10/2 for the pattern. Tencel Shawl woven by Sue Taube. She used 5 different color ways of Just Our Yarn (JOY) 10/2 tencel in the warp, threaded in the “Italian manner” of crackle weave (polychrome crackle weave). Weft was 3 different JOY tencel yarns, one was 10/2 & the other two were 20/2, all different color ways, kept in the same order for the entire shawl. ​Free form weavings by Christy Westmoreland, created on her Saori loom with a variety of materials. “Autumn Harvest”, 23" x 60", a variety of yarn, photo strips, leather, ribbon, feather, crepe myrtle bark and cotton ball twigs. I began this weaving in Dawn Hummer's Saori Weaving class at the end of September. "The Brilliance of Autumn", 32" x 43", a variety of yarns, scarf, dyed bamboo, branches and silk plant. The orange circle in the branches is a pumpkin. "Grounded", 24" x 32", a variety of yarn, roping and cording with dried weeping willow branches wound into circles. The photo of ropes and buoys was taken 3 years ago when my husband and I did a motorcycle trip in Nova Scotia. I just likes the shapes and colors. So I used the picture as inspiration for dyeing a tencel warp in Mary Kircher's studio class a few weeks ago. The warp became a turned twill shawl with the help of some stripes of solid tencel in complimentary colors of shale gray, grey blue, greyed teal and sienna. ​For the "loopy blue" piece I used 3/2 pearl cotton for warp, assorted fibers for weft loops and an additional linen thread that was worked close to the selvedge. While it’s not quite as expressive as the green piece, I do love the randomness of the loops. My life, my work, my world - a little randomness keeps it interesting. Deflected doubleweave scarf woven in Valley 8/2 tencel (shale and black) and Jaggerspun 18/2 superfine merino (vanilla). Elisabeth Hill workshop, June 2017. 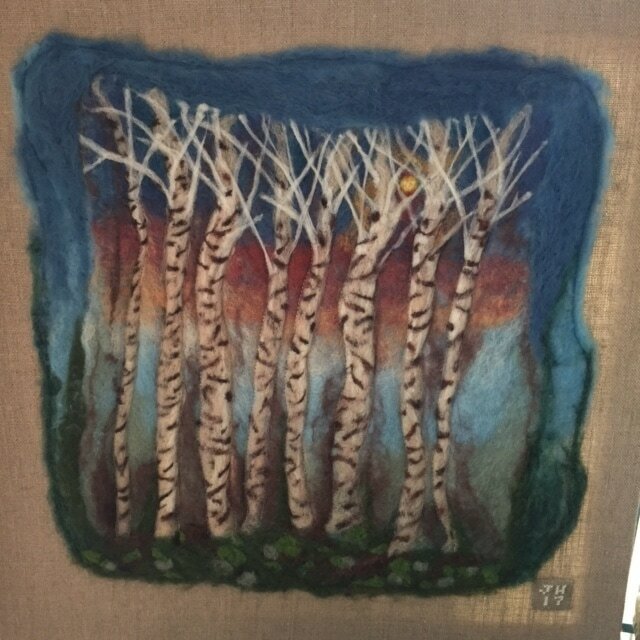 Size mounted is 20 x 20"
Combination of wet and dry-needle felting. Machine stitched along the trees. ​She says " it 3 years ago in CT and finally finished it!" A mixed warp linen table runner, woven by Pattie Lamb. The warp a mixture of 16/1, 16/2 and 8/1 tow line in 4 colors. The structure is a point twill threading woven in an M&W treadling. 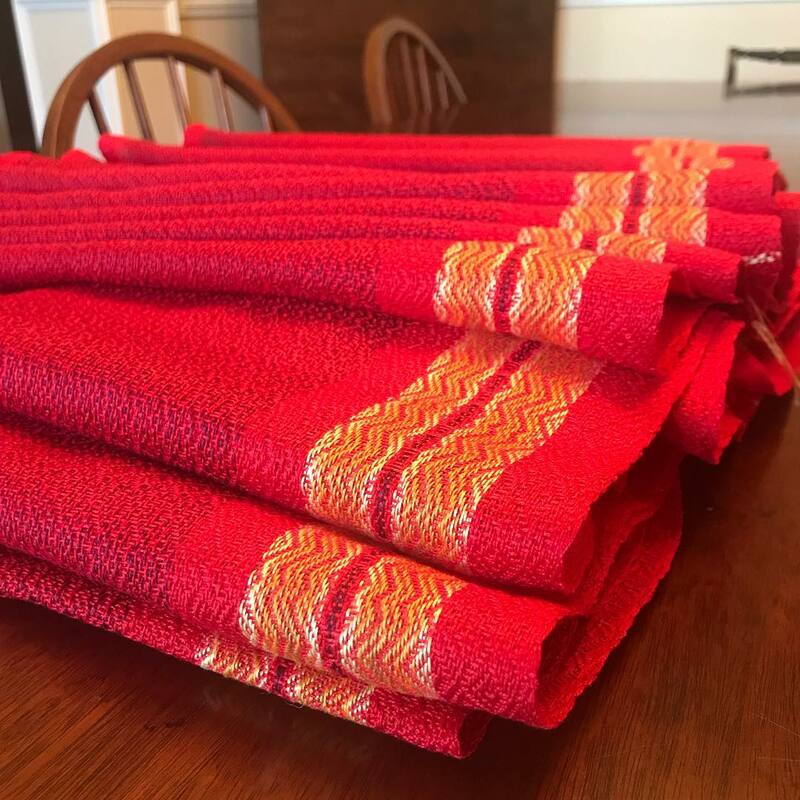 ​Pattie Lamb, Janice Kohl, and Jane Patterson have been weaving "More Than Pink" cotton and linen scarves for the Warpsters upcoming Race for the Cure event on May 6th. The Lam-Moore family mascots, Oswald, Jr. and Esmerelda will join us on our walk. From Diane Byrne a tapestry collage: "This small tapestry was an experiment with different textures, using wool and ribbons as weft. 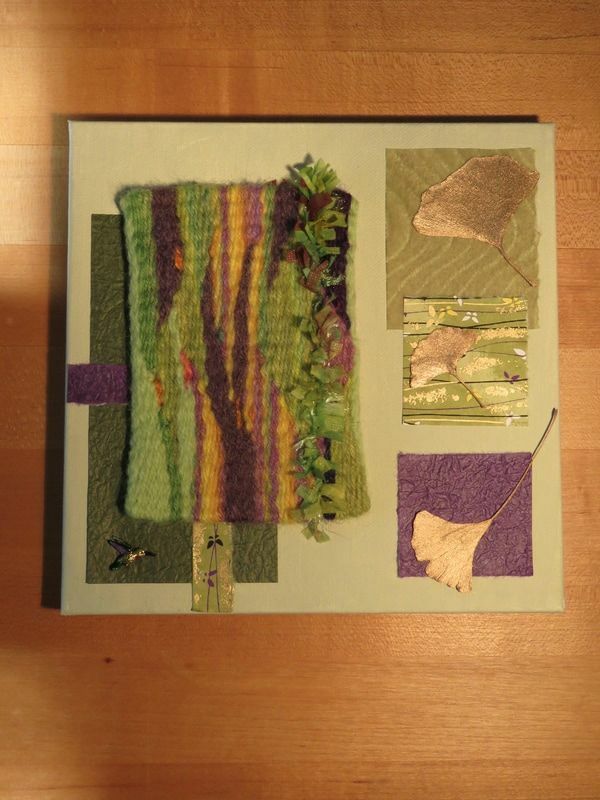 The Contemporary Textiles study group looked at collages in February, and I was inspired by one of the collage artists to combine my tapestry with papers, painted gingko leaves, petrified wood, and a colorful postage stamp that I had on hand." ​On the left, from Diane Byrne: "This Boro-inspired collage combines a small tapestry with torn Japanese papers, gingko leaves, and a tiny hummingbird button. I tore the edges of the paper to represent a Japanese technique known as Boro. Boro means "ragged" and refers to fabrics once used to patch garments of fishermen and peasants. (The Contemporary Textiles study group also studied Boro in February)." 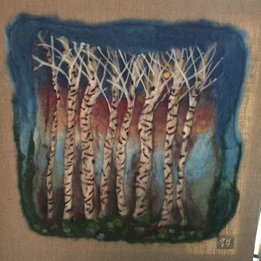 Wall hanging woven by Kelli Crispin for the 2016 Weaver’s Challenge. Her challenge: bright colors, hand-dyed yarn, 2 weaves, finish with beads. Her piece: wool warp, commercially dyed wool/mohair weft and edging cords, hand-dyed cotton weft, plain weave and diamond twill, Jasper and glass beads, 17" x 24"